Mau 's gonna be a man. He's sure of that because his last test is ending tonight. He 'll come back home, cheering with his family, his friends and the all Nation of his beautiful island. But something is going wrong. The birds flee high in the sky and the sea wait and stay calm and flat, like a mirror of possibilities. And ther will be plenty soon, and plenty of questions: what is Nation ? Where is the gods ? Who the hell is this ghost girl ? Why are we here and what for ? It's just the beginning of an initiatic journey wich will bring a young man a man 'soul. 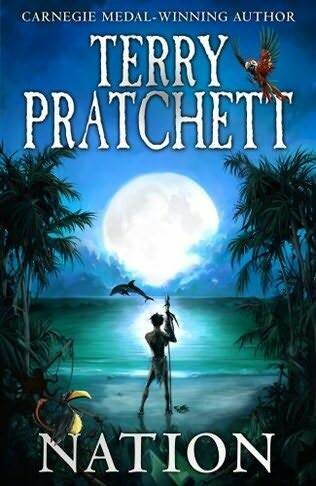 Terry Pratchett let us choose our own way on this island and take what we really want from the questions Mau's asking to himself. Nation, culture, religion, feelings, life itself are put under the light of this island' sun. A brand-new « Robinson Crusoe » for younger and a beautiful reflection of our own existencial questions. A magnificient story to read on a foreign country.